Affording elegance and all the amenities expected of a truly grand hotel, The Hotel Hershey offers 276 classic guestrooms and over 20 suites surrounded by the vibrant gardens and picturesque landscape of Hershey. 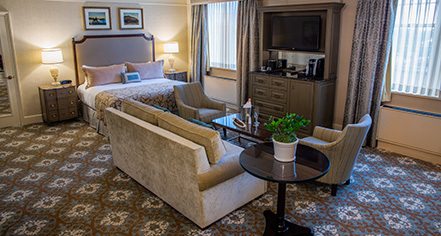 Furnished in refined decor and tasteful fixings, guestrooms at The Hershey Hotel illustrate a rich elegance boasting the ultimate comfort and luxury. Guests at the hotel can enjoy original artwork, historic photos, and the signature Hershey's Kisses chocolates at turndown. 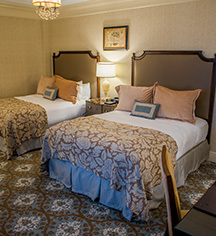 Deluxe guestrooms are available with one king-size bed, one queen-size bed, or two queen-size beds. Accessible guestrooms are also available. Featuring a variety of floor plans and additional amenities, suites at The Hotel Hershey boast the ultimate luxury, accommodating the unique needs of every guest. The hotel offers over 20 premier suites, including the Sweetest Suites, specially themed accommodations inspired by the rich history and legacy of Hershey. Among the Sweetest Suites are accommodations named after Milton and Catherine Hershey, illustrating their significance on the town inspired by chocolate. Recently redesigned, the 2,100 ft2 Milton Hershey Suite features a soothing palette and original artwork that pays tribute to the the suite, hotel, and city's namesake. Accommodating up to 10 people for sleeping, the Milton Hershey Suite is furnished with two bedrooms, two and a half baths, a sunroom, living room, dining area, and an outdoor patio with commanding views of the town. Welcoming guests with a portrait of its namesake at the entry vestibule, the Catherine Hershey Suite was renovated to celebrate Catherine's love of gardens with displays of stunning watercolors and her signature yellow roses throughout the space. With 1,450 ft2, the opulent suite sleeps up to 8 guests with two bedrooms, three full baths, a living room, dining room, and a step-out balcony. The master bedroom features a fainting couch, similar to the one in Catherine's bedroom in High Point Mansion. Surrounded by thick Pennsylvania woods with nearby trails, the Woodside Cottages at The Hershey Hotel are comprised of ten spacious, multi-bedroom cottages and one meeting cottage. As the most premium accommodations at the hotel, the cottages feature marble baths and native stone hearths that exemplify intimate luxury. Guests of Woodside Cottages have the option of reserving individual bedrooms or the entire cottage, which is furnished with a multi-functional great room featuring a fireplace, cathedral ceilings, and antique wood floors.